Patriotic costumes such as Statue of Liberty, Uncle Sam, and American Flag costumes are great for celebrating lots of different US events and occasions. A patriotic costume displays your love for liberty, pride in your country, support for the US troops, and the American way. Patriotic costumes work well for dressing up for many occasions such as the 4th of July, Halloween, President’s day, Halloween, baseball games or any other sports event. Patriotic costumes normally consist of garments that have the colors red, white, and blue of the American Flag. The iconic status of the Statue of Liberty and Uncle Sam in American history makes them an excellent patriotic costume idea. The costume of Uncle Sam Costume has all the colors of the American Flag. Check out these options that you have available online! 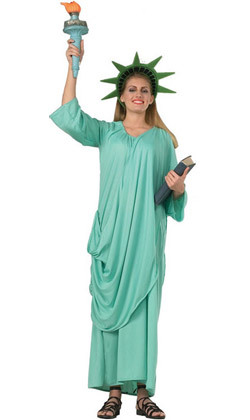 Stand strong and confident in this beautiful Statue Of Liberty dress for women. This costume includes the drapes, Liberty headpiece, and torch! A great deal for a complete set! Available in woman sizes from small, medium, large, x-large, and plus sizes (1X-3X)! This unisex patriotic striped tunic is for any adults who want to celebrate America in a parade, event, party, or holiday festival. One size fits most adult men or women with chest size 48-52. Your child will love this graceful Lady Liberty dress which includes the torch and crown. Available in children sizes medium, large, or x-large. This is a more modest version of the Liberty dress which includes the attached drape and sash as well as headpiece. Torch and sandals are separate. Standard woman size up to size 12. You can make the US flag more attractive by dressing up as one patriotic ladies! If you are in a festive mood, why not celebrate it like a patriot. This clever outfit looks like a typical dress at first but it displays the USA flag when you extend your arm. La Liberté éclairant le monde (Liberty Enlightening the World) is what the French called the Statue of Liberty which was created by France back in the 1880's as a gift to the United States of America. Now she stands in the New York Harbor on Liberty Island where in the early days immigrants from Europe would arrive to America seeking a new life. The 305 feet statue stands for: liberty, justice, enlightenment, and freedom. Over the years the copper on the statue oxidized to give it the famous green tint.